Not to be confused with Bandar bin Saud bin Abdulaziz Al Saud. 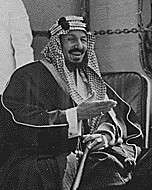 Bandar bin Abdulaziz Al Saud (Arabic: بندر بن عبد العزيز آل سعود‎‎, born 1923) is a Saudi royal and the tenth son of King Abdulaziz, the first monarch of Saudi Arabia. He is the eldest surviving member of the ruling branch of the House of Saud (agnatic descendants of Ibn Saud). Bandar was reportedly born in Riyadh in 1923, though Talal Kapoor reports his birth year as 1921. His mother, Bazza II, a Syrian or Moroccan woman, died in 1940. He was the tenth son of King Abdulaziz, and his full brother was Prince Fawwaz bin Abdulaziz Al Saud. Prince Bandar stepped aside from the line of succession, despite opposition to Sultan bin Abdulaziz's appointment as second deputy prime minister by King Fahd in 1982. He was given a huge bribe by which he agreed to settle down and to step aside from the throne. His only government service had been as the director general of the Interior Ministry, and the fact that his mother was Moroccan may also have counted against him. Similar claims by Musaid, his full brother, were rejected because his son had assassinated King Faisal in 1975. As compensation, however, two of Bandar's sons were given important jobs: Mansour bin Bandar was made the commander of Prince Abdullah Air Base at Jeddah and Faisal bin Bandar the governor of Al-Qassim Province. Bandar's only official government position was as Director General of the Interior Ministry. His various business concerns include Tabuk Cement Co. and Riyadh Recreational Hotels Co. His sons have served in both government and military posts, Faisal was previously Deputy Governor of Asir Province, and served as Governor of Al-Qassim Region from 1992 to January 2015 when he was appointed governor of Riaydh. Another son, Abd Alaziz, was deputy chief of the Al Mukhabarat Al A'amah (Intelligence Presidency) until 5 October 2012, when he resigned from the post. 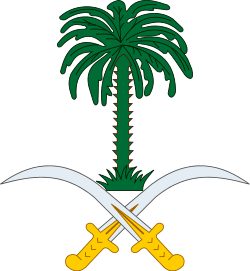 Bandar's third son, Khalid bin Bandar, served as the president of general intelligence and as the governor of Riyadh Province and was a Lieutenant General and commander in the Royal Saudi Land Forces. A fourth son, Mansour, is a Royal Saudi Air Force (RSAF) officer who served as the commander of a McDonnell Douglas F-15 Eagle squadron at King Abdul-Aziz Air Base (Dhahran) in the early 1980s. 1 2 3 Sharif, Sabri (2001). The House of Saud in Commerce: A Study of Royal Entrepreneurship in Saudi Arabia. New Delhi: I. S. Publication. ISBN 81-901254-0-0. ↑ Kapoor, Talal (8 October 2012). "Succession Issues - A Generational Change In Dynamic". Datarabia. Retrieved 9 October 2012. 1 2 3 4 Henderson, Simon (1994). After King Fahd:Succession in Saudi Arabia (pdf). Washington DC. ISBN 978-0944029558. Retrieved 16 August 2015. ↑ "Saudi Arabia replaces deputy chief of intelligence". Al Arabiya. 5 October 2013. Retrieved 10 February 2013. ↑ "U.S. President congratulates Custodian of the Two Holy Mosques". Ain al Yaqeen. 11 November 2011. Retrieved 10 May 2012. ↑ "Prince Abd alaziz bin Bandar Relieved of Post". Saudi Press Agency. Jeddah. 5 October 2012. Retrieved 5 October 2012. ↑ "Saudi king names Prince Khalid bin Bandar as new Riyadh governor". Middle East Online. Retrieved 14 February 2013. ↑ "Prince Khalid bin Bandar in Turkey". Saudi Press Agency. 19 May 2012. Retrieved 21 May 2012. ↑ "Khaled appointed Riyadh governor, Turki his deputy". Arab News. Jeddah. 15 February 2013. Retrieved 15 February 2013.